Several months ago Nilton, from the village of San Francisco where we have our first church plant, started visiting a neighboring village called New Jerusalem. Although this is a very small village like San Francisco (both only have seven families) New Jerusalem did not welcome Nilton with open arms. They seemed to be open to some visits but not very open to hearing the Gospel. This did not stop Nilton from visiting or sharing the Gospel but unfortunately this was met with some hostal responses. Nilton told me that Wagner would threaten to fight him often, Herman, Wagner’s father, would be very cold to him and the women would not respond to him well. However, after repeated visits of lovingly reaching out to these families Nilton finally won them over and one by one they started to accept the Lord into their hearts. 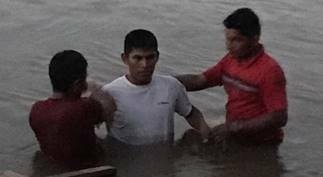 Changes began to be evident and a hunger for more of God started to dominate their behavior and so Nilton and some others from San Francisco continued to visit them and share the Gospel and disciple them. After some time they brought Maria and I in and we also began sharing the Word of God and prayer with them. In fact on this last visit just last week Maria was sharing with Herman’s wife and two of his teenage daughters, and as she did the girls were so moved they started crying. Since they are not familiar at all with the movement of the Holy Spirit they did not understand why they were crying until Maria explained that it was the Lord touching them and showing them how much He loved them. When it came time to leave Herman’s wife Antonia, was thanking us profusely for coming and was also moved to tears that we would come from such a long distance at our own expense (although I pay Maria’s way each time) and leave homes and families to come to them to share Christ. The Lord is truly doing a huge work in the lives of these families and we are determined to help them become a viable church body. Wagner, the one that often wanted to fight Nilton, has since accepted the Lord, was baptized with his wife and wants to be a leader of the church. He is very hungry for the teachings of the Bible but does not read and so I have coordinated with the school teacher in San Francisco to hold evening classes for adults to learn to read which Wagner is interested in attending. Our prayer now is for Herman, the father of these families that make up New Jerusalem. He has not yet experienced the saving power of Almighty God but instead is a witch-doctor. We are praying for him to be softened to the Lord through the evidence of his children’s lives so that he can see what the Lord can and wants to do in his. Please pray with us for this community as they make the great transition from the kingdom of darkness into the kingdom of light. A glorious answer to prayer came while Maria and I were in San Francisco last week. There are two families in this community who have not yet accepted the Lord and so I have been praying for their salvation along with others in the community. The day finally came when one of these families asked Maria and I to pray for their baby who had a fever for about a month. As it turned out the baby of the other family who had not accepted the Lord yet also had a fever and since Maria was not available at the time Nilton and I went to pray for that baby not realizing that it was the wrong family! This family did not ask for prayer and the baby only had a fever for two days but there we were praying for them. We ended up praying for the baby and her mom then sharing the Gospel with her, her sister and her mother and all three accepted Christ! 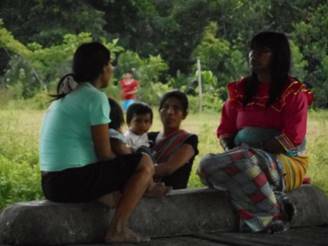 We then went to the right family who asked us to come and prayed for that baby as well and briefly shared the Gospel with the mother but she did not accept the Lord at that moment. We were however, able to explain to her the dangers of bringing her baby to a witch-doctor, which she and her husband did. We then prayed to break the power of agreement that the couple made with the witch-doctor to do whatever he felt was necessary to heal their child. I asked the father the next day if the fever was gone and he said it was so glory to God for His manifest presence and power to heal. We will be traveling to another river this Wednesday and returning on Monday called the Nucuray River. We have ministered on this river before and the people are very open to the Gospel. In fact often while waiting for the boat to take us to the river people from two different areas asked us to come to their villages to share the Word of God. The need for evangelism and dicipleship is huge here since there are no churches or ministries that are coming in to tell them about Christ. The harvest in this area is extremely ripe and the laborers are extremely few. 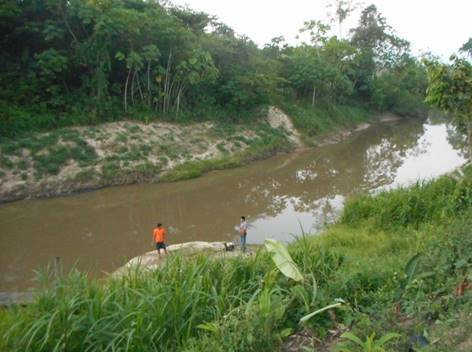 It is quite a challenge to balance the time needed to minister on both the Shishinahua River where the villages of San Francisco, New Jerusalem and so many others that need Christ reside and the Nucuray River where there are no churches or ministries to serve the people the Bread of Life. Would you please keep us in prayer for this trip to the Nucuray River that we will use every minute and every opportunity to wisely and effectively bring everyone to the knowledge of our dear Lord and Savior. Thank you so much for keeping us in prayer for safe travels, strong guidance and direction for delivering the Word of God and open and receptive hearts to all that the Lord wants to do in the people.